Duty to God - P.R.A.Y. “Duty to God” is at the heart of the Scouting movement. Religious emblems reinforce this spiritual component and promote many of the values found in the Scouting program. The purpose of this “Duty to God Promotion Patch" is to encourage youth and adults to learn about, promote, and participate in the religious emblems programs. The Duty to God Promotion Patch is a four-segment puzzle patch that is 100% embroidered. The segment with the kneeling Scout is the "anchor" patch and the first segment that should be earned. Participants are encouraged to earn all four segments over a four year span. Patches may be pre-ordered for distribution at the presentation / information seminar. 1. Attend or coordinate a presentation or information seminar on religious emblems (a sample script and other resources and suggestions are available here, or order the DVD from our webstore). Youth can commit to earning the religious emblem of their faith at an appropriate time, making a presentation on religious emblems to another unit, helping younger Scouts earn their religious emblem, helping to establish a religious emblems program in their local congregation, etc. Adults can commit to having 50% of families participate in the religious emblems programs, commit to nominating a worthy adult to be recognized with an adult religious award, serving as counselor in their local congregation, etc. What is the purpose of the Duty to God Promotion Patch? The purpose of this patch is to encourage youth and adults to learn about and promote the religious emblems programs. Can both youth and adults earn this patch? Yes. Both youth and adults may earn this patch. Is this patch for all faiths? Yes. This patch requires that you promote the religious emblems programs of all faiths. A person from any religious background may earn this patch. You are required to: 1) attend or make a presentation on religious emblems, and 2) make a commitment to Duty to God. What does it mean to "make a commitment to Duty to God"? At the end of your presentation on religious awards, Scouts and leaders will be asked to make a commitment to fulfill their Duty to God. This means that you do not have to wait until you have earned your religious emblem in order to receive this patch. Making a commitment to Duty to God can mean talking to your clergy about earning your religious emblem, presenting information to your congregation, helping younger Scouts learn about religious emblems, etc. When can I order the Duty to God Promotion Patch? You may order patches at any time here. You may pre-order the patches to distribute them at your presentation. How do I make a presentation? There are free resources available online here. These resources include scripts, slide presentations, a video on religious emblems, and parent handouts. These resources are also packaged as a DVD available for $5.00 from P.R.A.Y. Does this patch replace the square knot? No. 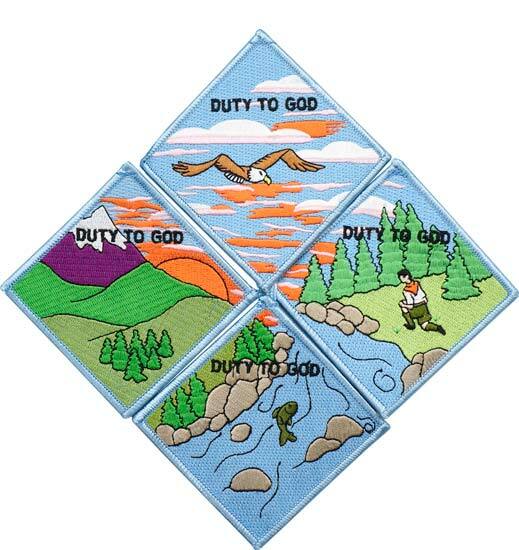 The Duty to God Promotion Patch indicates that you have learned about the religious emblems programs. The Universal Religious Square Knot indicates that you have earned your religious emblem. The two patches are completely different and not to be confused with each other. Where is it worn on the uniform? The Duty to God Promotion Patch is a temporary patch and is worn on the button of the right shirt pocket. Does the Scout Shop carry these patches? No. The Duty to God Promotion Patch is administered by P.R.A.Y. and is only available through P.R.A.Y. If I want to order patches for my unit, will I get a price discount? If a Scout just recently earned his religious emblem, does he qualify for this Duty to God Promotion Patch? Yes. A Scout who just recently earned a religious emblem may receive a Duty to God Promotion Patch. However, in the following years, in order to receive the next segment of the Duty to God Promotion Patch, he will either have to earn another religious emblem (or help make a presentation on religious emblems to another group). Why is this a four-segment puzzle patch? The intent of the puzzle patch is to encourage leaders to make presentations on the religious emblems every year. What is the anchor patch? The kneeling Scout segment is the anchor patch and it will always be the first segment that a Scout receives. It is the anchor around which all other segments will be added. This patch will be available every year regardless of the rotation. Is there a designated second, third and fourth segment? No. A rotation is in place, but the year you start will determine which segment you will acquire for the second, third and fourth segments (i.e. you will acquire the segments in a different order depending on the year you start). I make presentations at Pow Wows and Round Tables every year. Can I hand out patches to the leaders at these trainings? Yes. The Duty to God Promotion Patch may be distributed at adult trainings to encourage leaders to make presentations to their own units. Is this a BSA program? No, this is a P.R.A.Y. program created to promote Duty to God to members of the BSA. Find and order whichever Duty to God patch segment you're looking for from our online store.